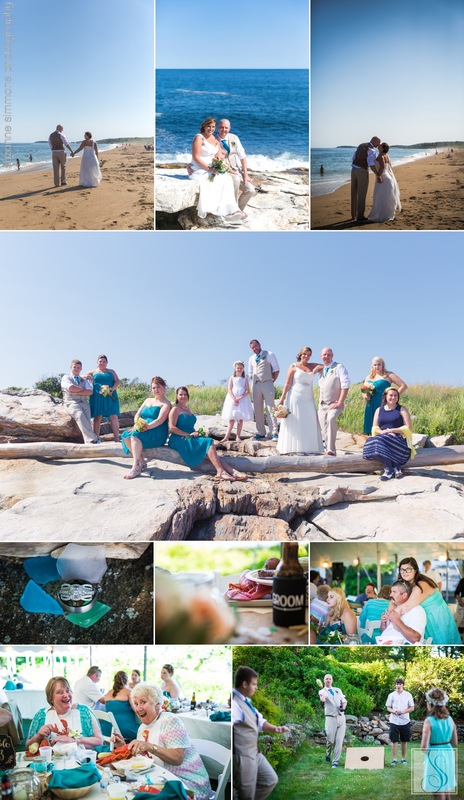 When Jessika reached out to me back in March, she snatched up one of my last 2016 dates available for her intimate wedding with Eric at the gorgeous Mooring Bed & Breakfast in Georgetown, Maine. Like many of my couples, they were planning their wedding weekend from away. As Jessika shared her vision for their day, I knew that we were going to be a perfect match for each other. The past three months flew by and this past weekend, all of their planning came to life. Jessika & Eric's wedding overlooking the ocean was filled with more personal touches than I could recount. From Eric's gift of a locket (yes, we all cried) to Jessika's borrowed blue sea star broach on her dress; their children standing by their side as they said their vows to their long time friend officiating the formalities; bridal portraits at the incredible Reid State Park and a reception filled with special touches. Every aspect of the day perfectly reflected Jessika & Eric and helped to tell the story of their long journey to that day. Looking back, the time that will stay with me the longest will be what their dear friend shared as she was marrying them. Although Jessika & Eric have known each other for a long time, it took them until now to come together. In her speech, their friend equated their relationship to that of glass turning into sea glass. Glass itself is created for a multitude of purposes from windows to bottles and more. Some of that glass winds up broken and in the ocean where, after many years, it comes out as the frosted, highly sought after sea glass that many comb the beaches of Maine for every year. In order to get to that point, it had to be broken, tumbled, and tossed around a bit. It's path was not easy. Yet it is oh so worth it for the beauty we see on our shores. I dare say that it was the perfect metaphor for these two as they start this new chapter of their lives together. Jessika & Eric, thank you so very much for trusting me capture the story of your wedding day. I am so very honored to have been able there with you both. Enjoy your family-moon with the Mouse!